It’s Week 2 of the Vegan Month of Food, a.k.a the Vegan MoFo! I hope to have several new recipes to share this week! I recently made a smoothie for my loves and thought I’d document the process. I’m not one for following recipes well, especially when it comes to smoothies. This particular smoothie was made with spinach, oats, bananas, and blueberries. I added a little almond milk too. This was tasty! My husband and boys LOVED it! My husband was leaving for a meeting so I added the oats to give it more substance. Isn’t it pretty! What are your favorite things to add to a smoothie? I like to add sweet potatoes (makes the smoothie thick), zucchini, and romaine…you get greens in and don’t even taste it! Ohhh I’ve never tried sweet potatoes or zucchini! I’ve thought about trying sweet potatoes though, they don’t last long around our house. The other day I did a strawberry, raspberry, and mango morning smoothie. I took all frozen fruit and blended the crap out of it lol. I’m thinking about adding some kale in there for a nutrient boost. We do green smoothies every morning, I’ve never thought to add oatmeal you genius, It’s like getting two awesome breakfasts at once! 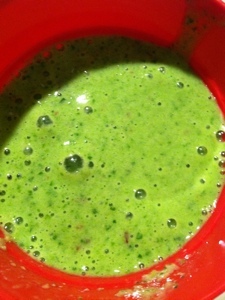 Love sneaking greens into my kids smoothies! They still have a hard time eating salads and such. This is a great way to sneak in some extra 😉 have you tried baby kale in your smoothie recipes? I just started using it in some smoothies with my kids. Yes! I bought a huge bag of baby kale from Costco and use it in most smoothies. Our preferred method for eating kale. lol! Yeah, Kale can be a little rough….